There are a number of abandoned asbestos mines in South Africa that may still pose a threat. Asbestos has been used in building materials such as roofs for houses and to build schools in the past. 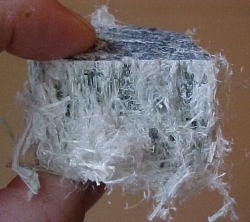 Asbestos is the name given to a number of naturally occurring, fibrous silicate minerals mined for their useful properties such as thermal insulation, chemical and thermal stability, and high tensile strength. The current federal definition of asbestos is the asbestiform varieties of: chrysotile (serpentine); crocidolite (riebeckite); amosite (cummingtonite/ grunerite); anthophyllite; tremolite; and actinolite. CANSA needs to ascertain the extent of these asbestos threats in South Africa and reduce human contamination wherever it may be occurring. Final regulations for the banning of asbestos came into effect in March 2008. Addressing a media briefing Tourism Minister Marthinus van Schalkwyk said the regulations would prohibit the use, processing, manufacturing, and import and export of any asbestos or asbestos containing materials (ACMs). Click here to make a secure online donation to support this research project or make a direct deposit to ABSA Bank, Account: CANSA Research, number: 4079965964, Branch: 632005, Reference: Type B Research – Asbestos Project.